Give Your iPhone 5 The, Uh, Throne It Deserves | OhGizmo! I like my iPhone as much as the next guy, but definitely not as much as Georg Dinkel. This dude spent 6 months building one of the most ornate iPhone docks we’ve come across. I mean, we usually don’t even cover iPhone docks because, well, yawn. 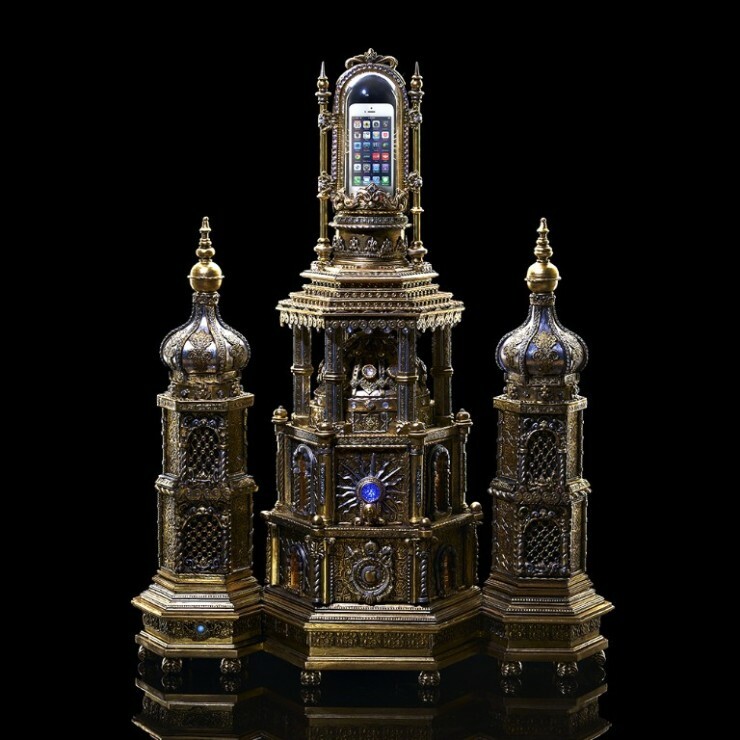 But the iReliquary 1.0, as he calls it, is something else. It’s made from rhinestones, gold and silver powder, as well as polymer clay for the main structure. It does work as a 2.1 channel, Bluetooth enabled sound system, and a lightning connector presumably also charges your phone as it sits… in its throne. It’s really all a bit ridiculous but intriguing at the same time. We don’t think it’s for sale, and there’s definitely not another one like it.